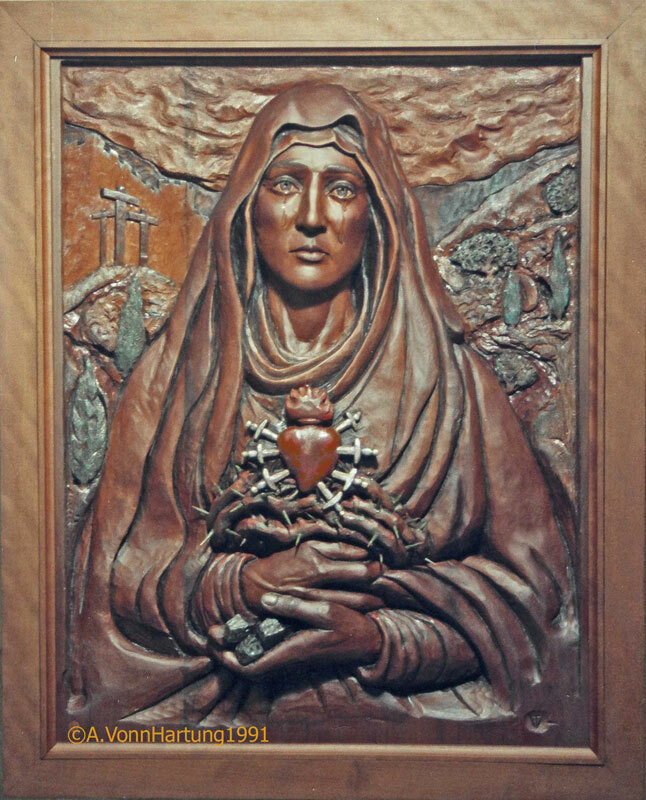 La Madre Dolorosa (Our Sorrowful Mother) is a high-relief wood carving expressing the agony of Jesus through his mother Mary: the betrayal by Judas, the arrest, torturous scourging, trial, carrying of the cross, crucifixion and death at Golgotha. She contemplates the seven sorrows of her life, represented by the seven swords piercing her heart. Mary holds the crown of thorns and the nails of the cross, gathering the cloak which Pilate draped on her son, mocking him as a king; in the manner of its form and folds she appears to be with child, reliving the Annunciation, Immaculate Conception and the time she carried him in her womb. In the background are the walls of Jerusalem symbolizing the Pharisees’ rejection of his truth, their scorn, expulsion and condemnation. He has been taken down from the cross but his tomb is still empty. He is, we can imagine, symbolically passing through the Sacred Heart of his Mother. This truth of Faith as Love signifies His triumph over death, that he truly was the Messiah, the Son of God. Christ’s divinity is further symbolized in that the cross could not hold him and the tomb could not keep him, that through his sacrifice and crucifixion (his atonement for our sins), and because of his resurrection we may share with him one day everlasting life in Paradise. 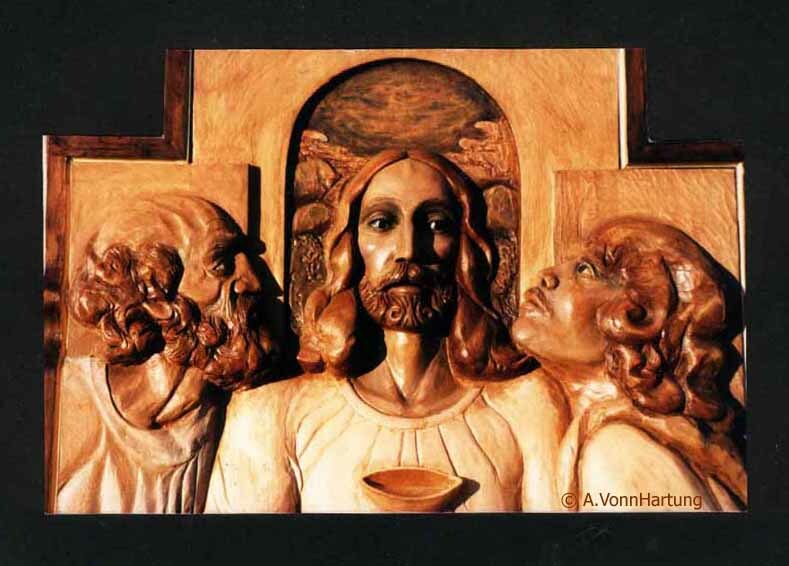 This life-size wood carving by A. Vonn Hartung was commissioned in 1991 by Padre Julio Victor García for the chapel in “Casa de Niños Manuel Fernandez Juncos” in San Juan, Puerto Rico. It is carved in a wood locally known as Itaúba which is extremely hard, dense and heavy. It comes from the Mato Grosso area in Brazil and is marketed as Pau Lope in the USA where it is principally used for decking. 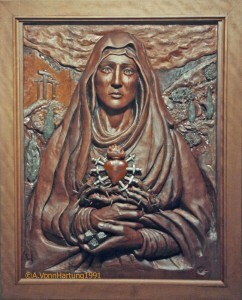 It was a profound experience for me to have been commissioned to carve “Our Lady of Sorrows“. The circumstances I know will interest you so I will share them. It was a very painful time that I was going through, extremely difficult both financially as well as artistically. I was not sleeping well and was deeply troubled. I remember rising early around 4 am, going downstairs to the studio and praying the Rosary. It has always been in times of extreme stress and personal crisis that I have turned to Mother Mary. I don’t know what I was expecting her to do, but I just felt comforted praying her name and resting my burden with her. I think I might have just been praying for strength and faith. Anyway I was lying on the floor in the position of the Cross with the Rosary beads in my hand when my wife Patty came down at about 7 am. She was somewhat surprised as I rarely prayed the Rosary. I explained to her how I could not sleep and just felt a need to pray the Rosary, how I felt much better and somehow things seemed to have cleared up for me. At 8 am the telephone rang and it was Father Julio García, a Cuban priest from our local parish. He sounded very excited and asked me if he could stop by within the half hour, and he arrived promptly. He showed me a picture of a painting of “OurLady of Sorrows”, which came from a Jesuit dining hall in Quito, Ecuador, that was said to have wept real tears (there is a substantial history of this phenomenon), and he asked me if I could either paint or carve it. I said I could do either one depending on what he wanted. We settled on the price, I told him I required half the sum before I could begin, whereupon he produced his checkbook and finalized the commission. Glory be to God! We felt as though the Holy Spirit had entered our little studio, as the spirit of our Lord stirred within Mary at the Annunciation. The carving was completed in two months and has lived in the chapel of Casa de Niños ever since. You are a living inspiration, Vonn. We are so grateful to have you and Patty in our lives! Dear Vonn… you are truly a master carver. I had seen photographs of this beautiful creation and was very impressed. When I had an opportunity to see it in person and the level of workmanship was astoundingly and magnificently beautiful. I stood in front of it at length and I started to have a strong reaction to it. As I stared at it I began to feel a profound feeling of incredible sorrow. As if vibrational waves went through me like the waves of an ocean. It brought tears to my eyes, and the tears turned to sobs…it was as if I felt her pain! I had to remove myself from it’s presence, and still I could not stop sobbing. I am not a Catholic…. I didn’t know the story of the La Madre Dolorosa. I will never forget that experience. I just wanted you to know what your talent has brought forth and how powerful that carving is. Blessings to you. Barbara…reading over your experience upon beholding La Madre Dolorosa in person, is deeply moving and reaches beyond emotions into spirituality. For me it seems as though you met the Holy Mother and were touched by her in a way that transforms ordinary knowledge. You may not be Catholic but I believe you were embraced by the MOST Christian of all women. You are Blessed! When I first stood face to face with the Madre Dolorosa I was transported. The wanderings and conversations of others in that art exhibit faded away. I was alone, looking directly into the face of a suffering mother who had lost her innocent son to a horrible death. Her pierced heart and the nails that had pierced her Son were in her hands representing the source of her suffering. But it was all there, on her face, where the pain was displayed. I looked into her eyes until my eyes also filled with tears. I have never before been so transported or so affected by any work in any medium as I was by the face of La Madre Dolorosa. A profound thanks toyou, Vonn! Paul, thank you for your most moving witness upon first seeing Our Sorrowful Mother in the exhibit at the State Department. Reading it and reading over again Barbara Moss’ reaction brings me back to first being touched by our Holy Mother and the inception of the commision to carve her. Having written about my personal encounter with Our Holy Mother through prayer, as I mention above in the article, I briefly recount it here: after praying the Rosary (the Sorrowful Mysteries) I received a call almost immediately from Padre Julio, who quite excitedly asked if he could come to our house as he had had a revelation. We were quite amazed when he appeared and offered me the commission to carve the Madre Dolorosa, and left me with a check for half of the money. A miracle? God works in mysterious ways! I had no model and sometimes when I look at the carving I wonder, did I really carve her? I truly believe that Christ Jesus, at one with His mother, guided me in creating this carving. Your transported experience is a testimonial to the power of Art. Traditionally such experience as you had comes through solitary prayer and meditation; that you were so engaged in the midst of a packed exhibit hall speaks of a deep spirituality, a spirituality generated by our Holy Mother and the events leading up to the suffering, crucifixion, death and miraculous Resurrection of her Son, our Lord Jesus Christ, that transformed the world. God Bless you for your witness!